Paper - Hodson and West, I.M. 1972, Holocene Deposits, Fawley. This was largely written by Ian West and kindly supported by the late Professor Frank Hodson. It is given here, slightly revised by Ian West and in only slightly modified and updated format with some minor additions. It is, however, without major changes, and, particularly in text it is still almost the original of 1972 (and can be used as this). It is here as a supplement to the various webpages on the geology of the Wessex Coast. It should be viewed in the light of more recent studies. For listings and some abstracts of later papers relevant to this see: Solent - Bibliography - General. Proceedings of the Geologists' Association, vol. 83, pages 421-442. Online Version, with minor revisions, 13th March 2013. 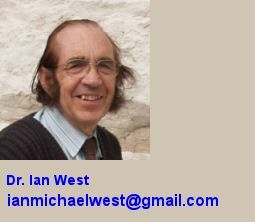 Dr. Ian West. ianmichaelwest@gmail.com. (a) The Fawley and Calshot Succession, p.428. (b) The Fawley Peat.,p. 429. 4. 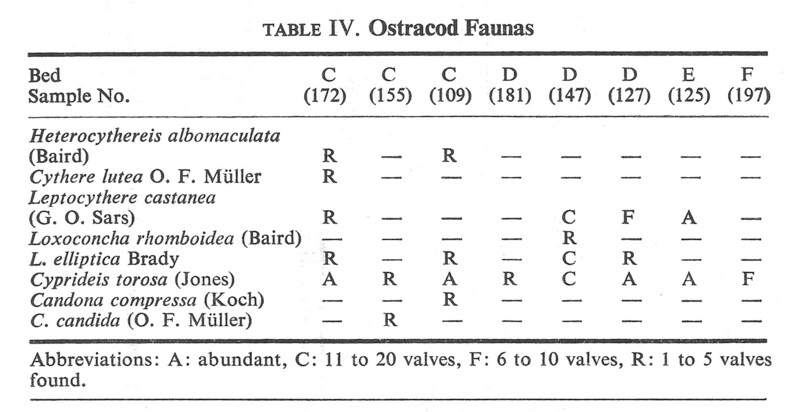 Molluscan and Foraminiferals Faunas, p. 430. (a) Other Southampton Water Holocene Deposits. p. 432. (b) Holocene Transgression. p. 433. 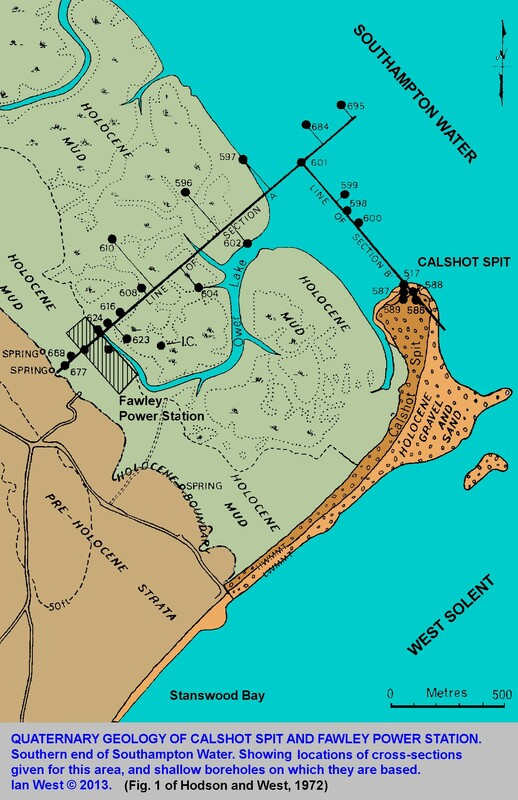 (c) The Development of Calshot Spit. p. 435. 7. Conclusions - Origins of Southampton Water. p.435. 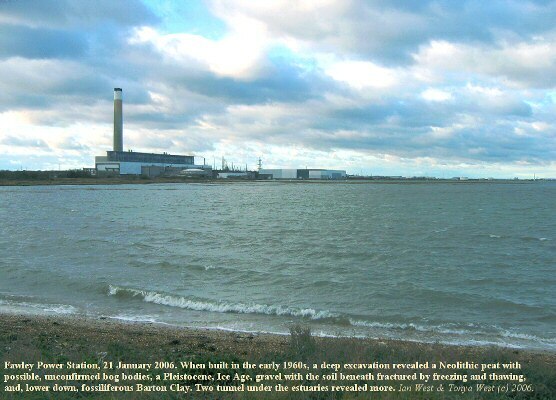 Holocene estuarine deposits up to 21 m. in thickness, which were encountered in boreholes and excavations at Fawley, partly fill the south-western side of the drowned valley of Southampton Water. Saltmarsh clays with peat lie above and below tidal-flat clays of Atlantic age. The mollusc, oraminifera and ostracod faunas and the coccolith and diatom floras of these Holocene deposits are discussed. 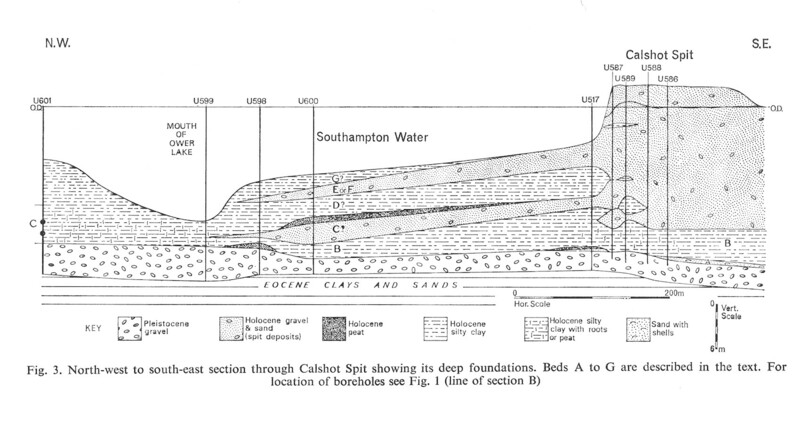 Gravels of Calshot Spit are interbedded with these sediments to a depth which suggests the existence of the spit in Atlantic times or earlier. The spit has deflected the deep tidal channel eastwards and has protected the south-western borders of the estuary from erosion. In the northern part of Southampton Water, late Holocene estuarine beds transgress northward over Holocene freshwater sediments. Much of the thick estuarine sequence at Fawley corresponds in age to a thin freshwater succession in the north. Excavations for the foundations of a new power station (Fig. 1) (SW 477026) at Fawley, Hampshire, on the south-western bank: of Southampton Water, provided large temporary exposures of estuarine silty clays and peats, formed during the Holocene development of Southampton Water. Additional information was provided by about 1200 shallow boreholes at this and at other parts of the estuary. (Numbers prefixed by the letter U refer to borehole records catalogued at the Department of Geology, Southampton University, and now in the NOC Library Archives.) 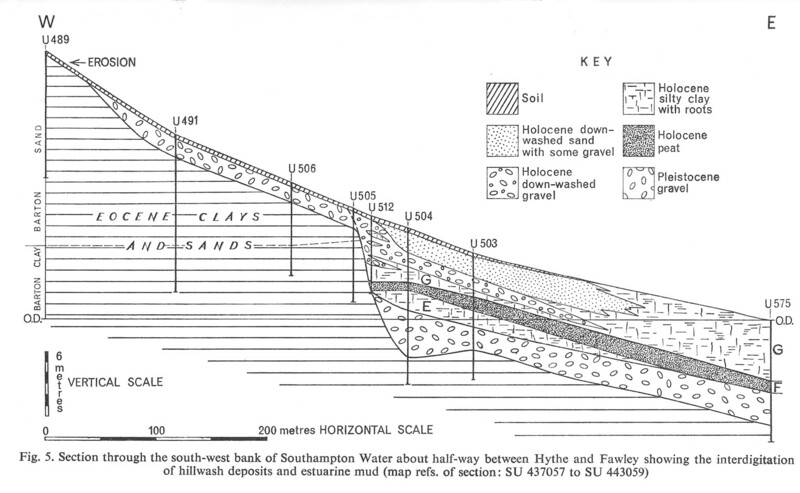 The Holocene sediments of Fawley lie above Pleistocene gravel, which, in turn, overlies the Eocene clays and sands described by Curry, Hodson and West (1968). Earlier boreholes in this area revealed the presence of peat (Everard, 1954). Samples of this peat were collected from the power station excavations for radiocarbon dating by Churchill (1965), and in Godwin and Switzur (1966) but the Holocene stratigraphy of the southern part of the estuary has not previously been recorded in detail. 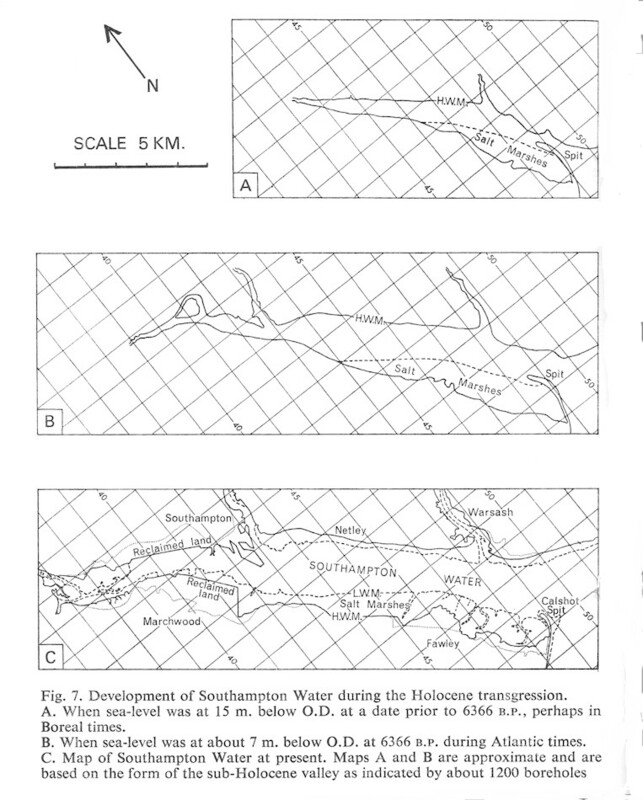 Holocene sections in and around the northern half of Southampton Water have been described by Anderson (1933), Shore and Elwes (1889), Hooley (1905) and Godwin and Godwin (1940). Southampton Water is a drowned Pleistocene river valley with submerged gravel terraces and a gravel floor. The upper surface of the gravel, where deepest, is at about 21 m. below a.D. The gravels consist of subangular flint pebbles in brown sandy matrices. In the southern part of Southampton Water, below the present high-tide level, the gravel is often overlain by estuarine mud deposits ((Shore, 1893) formed during the Holocene marine transgression. 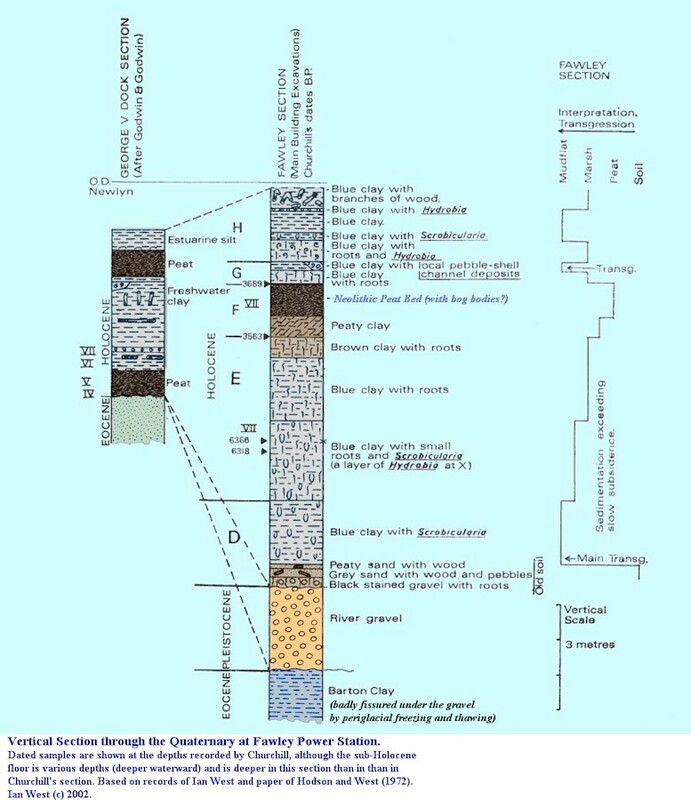 These are mainly soft, blue-grey, silty clays with some beds of peat and attain their maximum thickness near Fawley (Fig. 2) where they contain abundant estuarine and marine molluscan fossils. Freshwater forms are absent in this area. 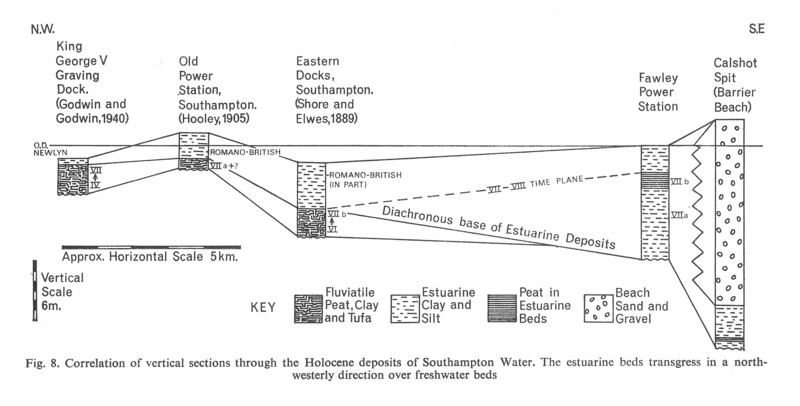 In the north-western part of Southampton Water, however, freshwater clays and peats with deposits of algal tufa occur (Shore and Elwes, 1889; (Godwin and Godwin, 1940). Several stratigraphic units can be distinguished. The lowest, and presumably oldest, Holocene bed (A in Fig. 3) was reported in a borehole at Calshot Spit (U 586) and has a base at 21 m. below O.D. It is a coarse compact sand, 0�61 m. thick, with clays and shells and is also present near Ashlett. At the spit, the shell bed is overlain by silty clay with peat (bed B). Bed C, found in several boreholes near Fawley, is about 4 m. thick and consists of silty clays and greenish sands with the roots of plants. Beds of peat are present. Samples of these sediments contain few molluscs or microfossils other than the remains of diatoms. These features suggest that they are marsh and fen deposits. Next follow silty clays (D) about 5 m. thick, usually without roots or peat. They contain intertidal molluscs and much microplankton and thus are probably of tidal-flat origin. They are overlain by root-bearing, silty clays (E), 4.5m. thick with peat. These are mainly of saltmarsh origin. Carbonaceous material in the lower part of these beds has been dated by Churchill in Godwin and Switzur, 1966) as 6366 B.P. and placed in pollen zone VIIa. The thickest and best developed bed of peat (bed F) at Fawley lies at the top of this sequence (Fig. 4). 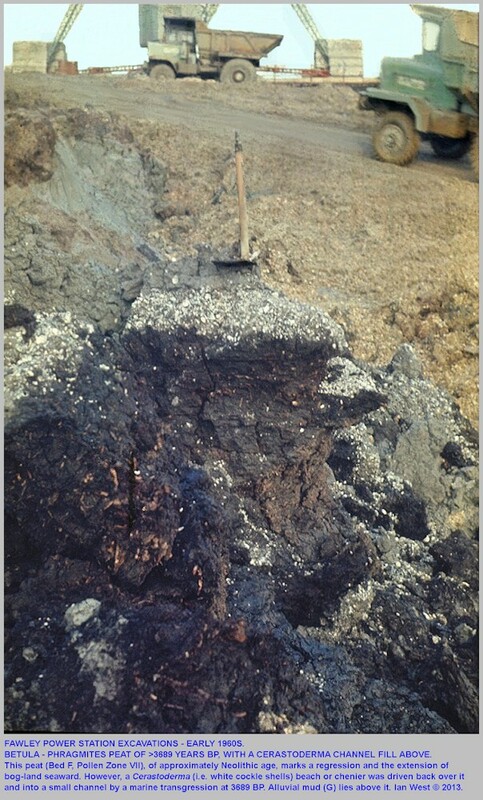 The uppermost part of this peat has been dated as 3689 BP and the base gave a similar date (Churchill, in Godwin and Switzur, 1966) suggesting that it is of zone VIIb. The statement in Godwin and Switzur (1966) that it belongs to zone VIIa is inconsistent with the radiocarbon date. An estuarine bed (G) up to 4.5m. in thickness and with molluscan fossils lies above the peat and extends to the surface. The common presence of roots indicates that it is mainly of saltmarsh origin at Fawley. Professor Shotton (in lit. 1964) reported that insect samples submitted to him from the base of this bed included remains of Bembiodon sp., a Sialid larva (alder-fly) and a Saldid (Hemiptera). Seeds of Menyanthes sp. occur. During deposition of these beds some erosion of hill slopes on the south-western side of Southampton Water apparently occurred. A series of boreholes provides a section (Fig. 5) about half-way between Hythe and Fawley where Pleistocene gravel followed by sand from the Barton Beds [Becton Sand] has been washed downslope to interdigitate with salt marsh deposits. The soil erosion could have resulted from deforestation by man in Neolithic or later times. Near a branch of Ower Lake, channel deposits (H) occur within bed G. Pebbles and numerous Cerastoderma shells are present in the base of the channel. The Holocene estuarine sediments at Fawley and other localities around Southampton Water are horizontally bedded or with very low depositional dips. The sediments have not built out from the shore with a deltaic foreset structure, as suggested by Evans (1965) for Holocene sediments of the Wash. Instead the silty clays have apparently been deposited at approximately equal rates over most of the areas of sedimentation. Vertical lithological changes are more marked than are lateral transitions. Either mudflat or marsh conditions were dominant at different times. The bed of Betula-Phragmites fen-wood peat (Churchill, in Godwin and Switzur (1966) at Fawley (bed F) ranges in thickness from 0 to 3.35 m. Boreholes show that it terminates rather abruptly, just west of the main branch of the creek, Ower Lake (Fig. 6), and its former north-westward extension. It is probable that the development of the peat was limited on the waterward side by a predecessor of this salt-water-bearing channel. Landwards the peat ends where the hillslope rises from the marshy borders of the estuary. This is also the landward limit of the Holocene deposits and almost coincides with the junction of the Barton Clay and Barton Sand on the sub-drift floor. Here, springs supply freshwater (Fig. 6). The Holocene deposits of Fawley are mainly blue-grey, pyritic clays in a very soft plastic condition with much organic matter. Pyrite is particularly developed in the roots of marsh vegetation. In some beds there has been disturbance of the mud by [the burrowinn bivalve] Scrobicularia, the remains of which commonly occur in burrowing positions (Fig. 4). There is much low-magnesium calcite throughout the clays, mainly skeletal carbonate cons isting of coccoliths, foraminifera and debris from the disintegration of mollusc shells. Prisms from fragmented Mytilus valves are common. Some minute, sublenticular crystals of calcite may have been precipitated inorganically as an indirect result of the photosynthetic activity of algae. Opaline silica is present in abundance as diatom remains and as monaxon sponge spicules. In the Holocene sediments of the northern part of Southampton Water from Netley Shoal (Kemp, 1890) to Redbridge Flyover (SU 367137), calcareous tufa of algal origin occurs. It was found at the Western Docks ((Anderson, 1933), while at the Eastern Docks masses of up to 1 m. or more in thickness and several metres in diameter were discovered (Kemp, 1890). The tufa usually contains freshwater mollusc shells and probably originated on the flood-plains of the bicarbonate-rich rivers entering Southampton Water. It is thus a useful indicator of the former distribution of freshwater deposits. The clay minerals at Fawley were studied by X-ray diffraction using Ni-filtered Cu Krt radiation. In most samples illite, kaolinite and montmorillonite are present. There is little chlorite. The mixed assemblages are probably mainly derived from local Tertiary sediments, the clay mineralogy of which has been described by (Gilkes, 1968). Because the sediments are almost all of intertidal, or just supratidal, origin the rate of sedimentation at Fawley is approximately equal to the rate of submergence. Thus, more than 7 m. of sediments have been deposited on a surface submerged to about that amount since 6366 years B.P. (Fig. 4). The average is about 1 mm. per annum. The thickest sequence of estuarine sediments at Calshot if averaged for the complete Holocene period yields a sedimentation rate of about 2 mm. per annum. These values differ little from the estimated present submergence rate of more than 2 mm. per annum (Valentin, 1968). 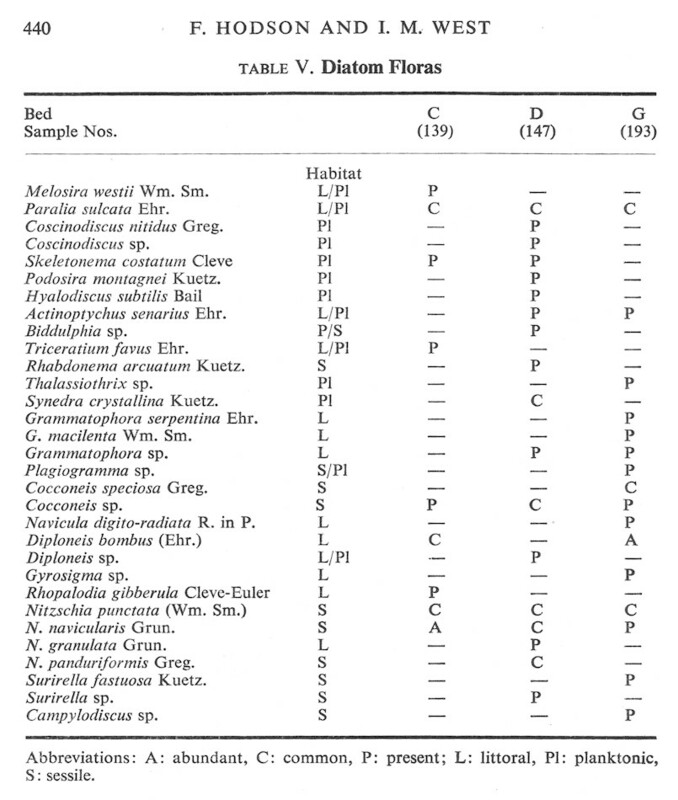 The molluscan faunas (Table I) of the Fawley Holocene contain few species although individuals are often abundant, a common feature of estuarine environments. Most species are of intertidal mud-dwelling or mud-burrowing habits but sub-tidal and saltmarsh species were also found. Molluscan remains are absent in the limited number of samples available from below bed D but there is little faunal variation from that bed upwards. Modern immigrant species are, of course, absent. The species found at Fawley are either marine or brackish water forms, in contrast to the freshwater faunas of the tufa and peat at the Eastern Docks and on the Netley Shoal (Kemp, 1890). Estuarine species, found in mud above the Eastern Docks peat, have been listed by Shore and Elwes, 1889, and those of similar deposits at the old power station, Southampton, by (Hooley, 1905). 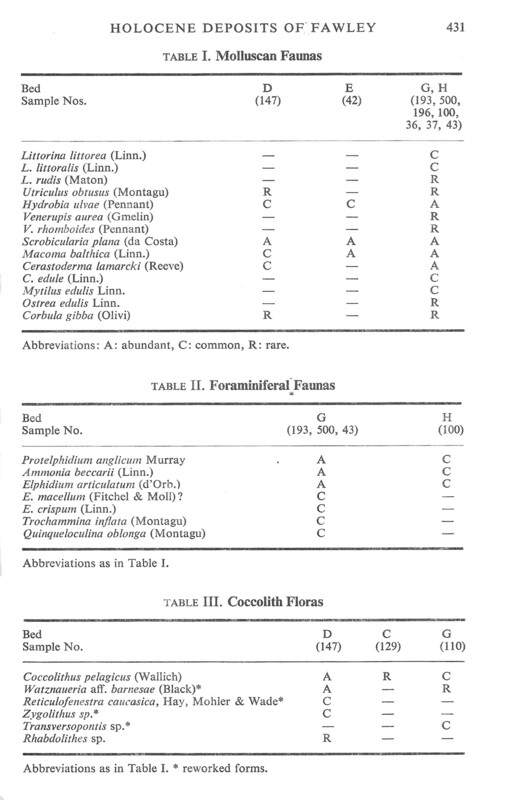 Dr. J. W. Murray of Bristol University identified foraminifera from the Fawley Holocene deposits, and the faunal lists (Table II) are based on his report. E. macellum (Pitchel and Moll)? This table is also abbreviated and abundances are not given here. See the reproduced page above. Reticulofenestra caucasica, Hay, Mohler and Wade"
He [Professor John Murray] stated (in litt., 1971) that the dominant species, Protelphidium anglicum Murray, Ammonia beccarii (Linn.) and Elphidium articulatum (d'Orbigny), characterise modern areas of hyposaline, shallow water such as that of Christchurch Harbour, Hampshire. The salinity could have fallen as low as a few parts per thousand, although most of the time it was probably between 10 and 30 parts per thousand. The temperatures would have been much the same as now. He observed that Elphidium crispum (Linn.) is a marine species commonly found on sand or seaweeds and that Trochammina inflata (Montagu) is a saltmarsh species. 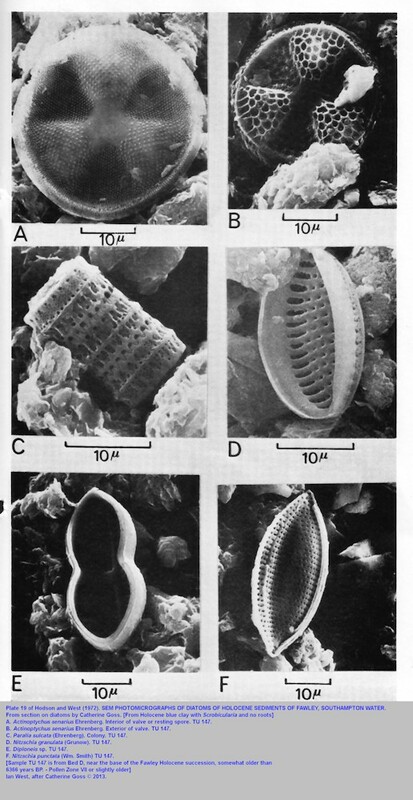 Coccoliths (Plate 20) are numerous in the silty clays of bed D at Fawley (Table III), Coccolithus pelagicus (Wallich) being particularly common. Similar coccolith debris occurs in beds E and G and no major difference in the calcareous nannoplankton floras were recognised. C. pelagicus is found at the present day in relatively cool-water regions, mainly in the North Atlantic (Black, 1968). Its optimum temperature according to Mcintyre and Be (1967) would be from 8� to 10�, and it should not live in water over 14� C. The present upper-layer water temperature of Southampton Water near Calshot ranges during the year from about 4� C. to 20� C. (Raymont and Carrie, 1964). Remains of the common coccolithophorid Emiliania huxleyi were not found. This is surprising since it is a geographically wide-ranging species and can tolerate cool and even brackish water (Black, 1964). Coccoliths, reworked from the Chalk, were frequently seen, particularly Watznaueria aff. barnesae(Black). They may have been supplied by the Test and the Itchen from the Chalk regions through which these rivers flow. Alternatively, [and more likely] transport by marine currents from the Chalk cliffs of the Isle of Wight, which are undergoing marine erosion, is possible. Reworked Chalk coccoliths were also found in the Bracklesham Beds at Fawley (Hodson and West, 1970). [this is significant because it accords with other data that the Chalk had been unlifted to some extent and was being eroded at the beginning of the subsequent Barton times]. Reticulofenestra caucasica Hay, Mohler and Wade, is probably reworked from local Eocene beds. The Fawley succession can be compared with other Holocene sections on the borders of Southampton Water. At the Eastern Docks, Southampton, peat of about 4 m. thickness was found underlying about 4�6 m. of estuarine mud (Shore and Elwes, 1889) Remains of Bos primigenius, reindeer and other vertebrates were found in the peat. Neolithic implements suggest that it is, at least in part, of Sub-Boreal age, which accords with its content of oak remains. A hammer-stone of Mesolithic type at the base of the peat [p. 433] was considered by (Godwin and Godwin, 1940) to indicate a Boreal or early Atlantic age. A Boreal or earlier date for part of the peat is also suggested by the presence of pine remains (Shore and Elwes, 1889). A section at the old Southampton power station was described by Hooley (1964). A single bed of peat, with pine and oak, was overlain by estuarine clays. Since oak was common from late Boreal times in this area, the peat probably belongs, in part, to this or later climatic stages. Peat from a nearby excavation has been found to be of late Boreal or early Atlantic age (Godwin and Godwin, 1940). At the base of the estuarine mud the remains of a small sheep were found, resembling those known from Romano-British deposits. At the King George V Graving Dock (Western Docks, Southampton) two beds of peat, with freshwater clays between, range from Pre-Boreal to Atlantic age or later (Godwin and Godwin, 1940). They are also overlain by estuarine mud. Borehole data show that this Western Dock area was part of a large abandoned Pleistocene meander (Fig. 7) partly filled with Holocene sediments. The early development of peat at the Graving Dock probably occurred because the deepest part of the early Holocene valley floor is only about 2 or 3m. below the pre-Holocene surface there. Poor drainage favoured marshy conditions at an early date at this locality, formerly on the borders of the River Test. The Fawley power station site, in early Holocene times was, in contrast, a well-drained hillslope of gravel about 12m. above the floor of the valley and the river. Fen conditions were not established there until sea-level had reached a fairly high level. Churchill (1965) compared the depths below O.D. of the Fawley, carbon-dated horizons with those of other British dated deposits. 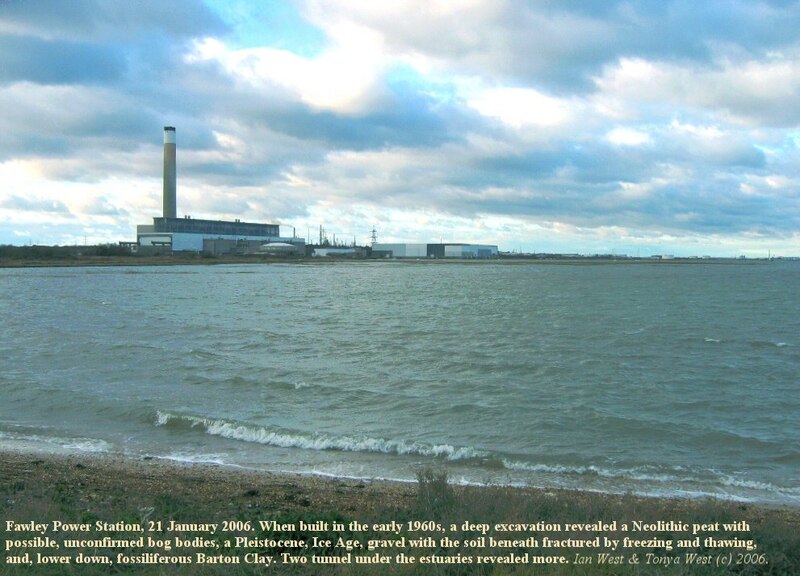 He concluded that there has been a depression at Fawley of at least 4.5 m. since about 6500 B.P., in addition to a eustatic rise of sea-level of about 3m. Below these dated horizons the basal shell bed (A) is the first evidence of Holocene transgression in the valley that was to become Southampton Water. Sea-level continued to rise, forming beds Band C, until sedimentation caused a gradual shallowing from mud-flats (bed D) to saltmarsh (bed E), then to fen in which peat (F) was formed. After deposition of the peat in Neolithic times a further transgression occurred with a return to mainly marsh deposits. The late transgression is of particular interest. At the Western Docks the position of the uppermost peat with alder has been regarded by Oakley (1943) as evidence of submergence of at least 4m. since about Neolithic times. He considered that the overlying estuarine deposit might be Romano-British. Shore and Elwes (1989) reported Roman pottery in the estuarine [p. 434] mud above the peat at the Eastern Docks, and the sheep remains at the old power station, referred to above, give further support to that view. It is, therefore, probable that the estuarine beds (G and H) above the peat at Fawley are also of Romano-British age. This would accord with the evidence for a Romano-British transgression in other parts of southern Britain (see West, 1967, who gives earlier references). Fig. 7. Development of Southampton Water during Holocene transgression. A. When sea-level was at 15m below O.D. at a date prior to the 6366 BP. perhaps in Boreal times. B. When sea-level was at about 7m. below O.D. at 6366 B.P. during Atlantic times. C. Map of Southampton Water at present. 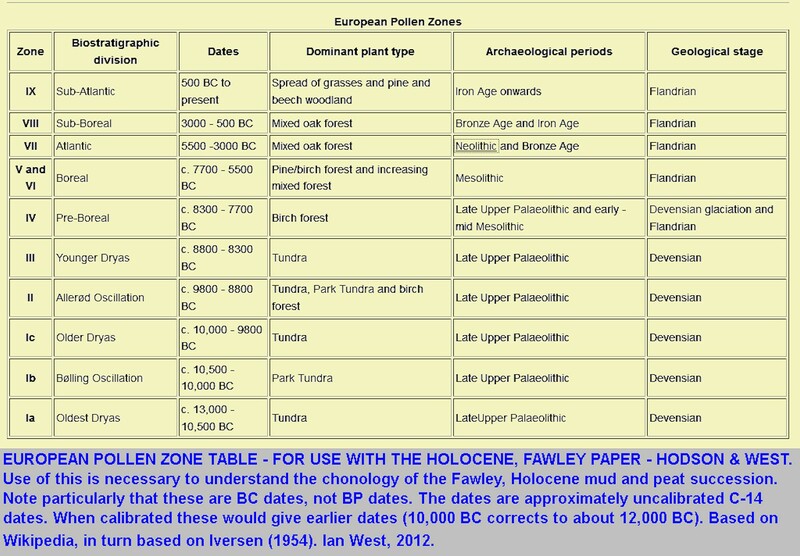 Maps A and B are approximate and are based on the form of the sub-Holocene valley as indicated by about 1200 boreholes. Boreholes (Fig. 3) show that the initially deepest part of the drowned valley of Southampton Water lies beneath Calshot Spit at the entrance to the estuary (Fig. 7). The spit, formed by longshore drift of beach material from the west, has apparently forced the deep channel of the estuary eastwards. It has provided sheltered water on the west bank for the deposition of the thick Holocene mud deposits (Figs. 1 and 7). The eastern end of the spit is abrupt and, although artificially steepened by dredging, is probably mainly controlled by equilibrium between the supply of material by longshore drifting and erosion by tidal scour. The continued existence of the castle , built at the end of the spit in the early sixteenth century, suggests that the spit is a stable feature. Boreholes, however, show that the recurved tip of the spit has at times extended farther to the north-west than at present. Two former extensions reached the mouth of Ower Lake (Fig. 3) and the younger of these may be responsible for the northward deflection of that creek. Marine gravels and sand lie beneath the spit to a depth of about 16�5 m. below O.D. These spit deposits presumably originated by longshore drift and, therefore, were formed mainly in the intertidal zone . Thus any particular spit deposit must be of approximately the same age as the adjacent intertidal estuarine mud at the same depth. This suggests that Calshot Spit existed at its present locality from Atlantic times or earlier. Deep foundations have similarly been found beneath many barrier islands and spits in the Gulf of Mexico (Shepard, 1960) where such coastal barriers were also stable during slow submergence. Calshot Spit was reported to be in a breached condition in 1611 (Buhler, 1952) not long after the Chesil Bank had been broken through by south or south-easterly storms ( Arkell, 1947). Rapid natural repair probably occurs after breaching, otherwise extensive erosion of the Fawley Holocene muds would have occurred. The long persistence of the spit is probably due to the relatively steep slope of the Pleistocene river valley on the west side of Southampton Water at Calshot. Thus as sea-level has risen the spit has easily remained in contact with the new shore line and the supply of sediment by longshore drifting has been unhindered. The deepest Holocene sediments beneath Calshot Spit have not been dated. The sea first entered the valley of Southampton Water early in the Holocene before the deposition of the earliest dated deposits of about 6366 BP. When the formation of the estuary commenced the broader deeper valley of the Solent was already a wide body of sea-water. The proximity of Fawley to this marine water probably resulted in high salinities in that area even when the estuary was much smaller. The May high-water salinity at Fawley is above 33 parts per thousand at present according to Dyer, 1969,. Hence fresh or very brackish water sediments have not been found there. Southampton Water has progressively increased in size since the beginning of the Holocene Period by flooding Pleistocene gravel terraces. Their morphology has largely determined its shape (Fig. 7) and the estuary has expanded laterally north-east and south-west of the original deep channel. Owing to the prevailing south-westerly winds some erosion, but relatively little sedimentation, has occurred on the north-east shores. Extensive sedimentation on the sheltered south-west borders, however, has caused the expansion of the estuary in this direction to become largely filled. The early development of Calshot Spit suggests that the prevailing southwesterly wind conditions, controlling longshore drifting, have long existed in this area. At Fawley there is also evidence of the long persistence of intertidal and marsh environments in the area of Holocene sedimentation protected by the spit. The control of sedimentation rates by submergence, a common feature of other estuaries (Scholl et al.) 1969, accounts for the near-horizontality of the Holocene strata here. Beds were limited by, and are therefore parallel to, former sea-levels. The lower deposits of peat (in beds B and C) in the estuarine deposits were probably formed in the Boreal or Pre-boreal stage. The next major development of peat in the estuarine sediments was in Sub-boreal times. These relationships of peat formation to climatic phases resemble those found in the Holocene deposits of the western parts of the Netherlands Jelgersma,1967). At the north-western end of the estuary the Quaternary fluviatile deposits record the effect of a cycle of regression and transgression. The Pleistocene river gravels were formed when base-level was lowered owing to the regression of the sea. When the Holocene transgression took place, the base level was raised with deposition by the rivers of fine-grained sediments on their flood plains. In contrast, in the southern part of the estuary the encroaching sea-water caused the deposition of fine-grained estuarine sediments above the gravels. As sea-level rose further the relatively saline, estuarine waters progressed up the river valleys over the freshwater clays and peats. The fluviatile/ estuarine junction is, consequently, diachronous (Fig. 8), and the estuarine sediments transgress north-westwards. Thus the estuarine beds are thick where they fill the deep valley of the southern part of Southampton Water but they correspond to a much thinner sequence of freshwater beds of the same age in the upper part of the estuary. The authors would like to acknowledge the generous assistance of the following: Dr. J. R. Earp and Dr. H . Squirrel of the Institute of Geological Sciences, the Central Electricity Generating Board, Rendel, Palmer and Tritton Ltd., Taylor, Woodrow & Co. Ltd., Esso Petroleum Co. Ltd., Southampton Harbour Board , Caltex Ltd., Hampshire County Council and Monsanto Chemicals Ltd . 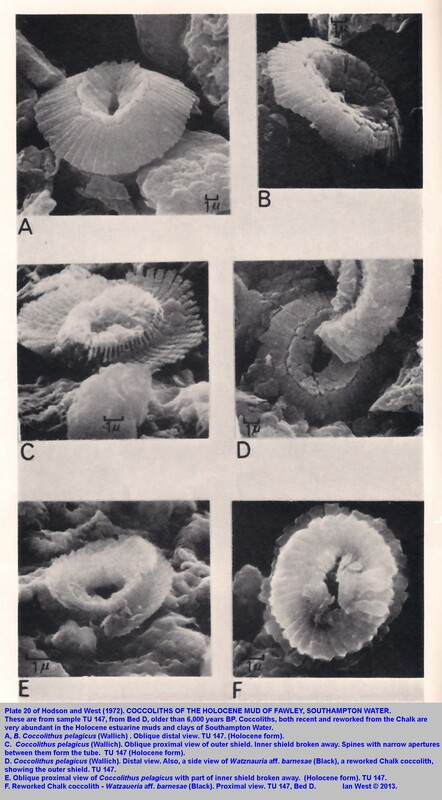 They would particularly like to thank Dr. J. W. Murray [Professor John Murray} for identifying the foraminifera. The authors are obliged to Mrs. M. Long for typing the manuscript and to Mrs . A. Dunkley [Anthea Dunkley] for redrawing the diagrams. Ostracods were found in eight samples examined from the Holocene deposits of Fawley (Table IV). Cyprideis torosa (Jones) and Loxoconcha elliptica Brady are thought to be mesohaIine, perhaps tolerating salinities from about 2 to 20ppt. Heterocythereis albomaculata Baird, Leptocythere castanea (G. O. Sars) and Cythere lutea O. F. Muller tolerate higher mesohaline salinities, perhaps from 20 to 30ppt. Species of Candona, however, are freshwater to oligohaline and the ostracod remains belonging to this genus could have been brought into the area by rivers. Cythere lutea O. F. Muller. Leptocythere castanea (G. O. Sars). Abbreviations: A: abundant, C : 11 to 20 valves, F: 6 to 10 valves, R : 1 to 5 valves found. A. Actinoptychus senarius Ehrenberg. Interior of valve or resting spore. TV 147. B. Actinoptychus senarius Ehrenberg. Exterior of valve. TV 147. C. Paralia sulcata (Ehrenberg). Colony. TV 147. D . Nitzschia granulata Grunow. TV 147. E. Diploneis sp. TV 147. A preliminary survey was made of the diatom contents of the Holocene sediments of Fawley. Abundant diatom remains were found in the beds examined (C-G) and they are mainly of species of saltmarsh or mud-flat habitats. Three samples, one from each of the beds C, D and G, were selected for further examination. Lists of species are given in Table V. Differential preservation may have introduced some bias as remains of discoid cells, which are more often of planktonic origin, were better preserved than remains of elongate cells. Many fragments of benthic species, probably belonging to Navicula Borey and Nitzschia Hassall, could not be satisfactorily identified. In all three samples, both planktonic and benthic forms are numerous (Plate 19). All benthic species recorded have been found living in or around Southampton Water at the present day. Epiphytic species occur in each of the three samples, indicating the former presences of macrophytes on the sediment surfaces. The species that were found in beds C and D are usually of mud-flat or sandflat origin and more planktonic forms occur than in bed G.
Most of the species present within the very recent bed G have been found in a diatom assemblage of a modem Southampton Water saltmarsh at Totton (map ref. SU 368138) which has been investigated by the present writer. In both cases there is an abundance of Diploneis bombus (Ehr.) (Plate 19, E). The variation in salinity of the estuarine water between Fawley and Totton probably has little effect on the diatom flora in the saltmarsh environment as there local salinities are, in any case, subject to rapid fluctuations. A modem diatom assemblage from the mud-flats of Hamble Spit (map ref. SU 483057) differs markedly in its flora owing to a more exposed habitat. A, B. Coccolithus pelagicus (WalIich). Oblique distal view. TU 147. C. C. pelagicus (WalIich). Oblique proximal view of outer shield. Inner shield broken away. Spines with narrow apertures between them form the tube. TU 147. D. C. pelagicus (Wallich). Distal view. Side view of Watznaueria aff. barnesae (Black) showing the outer shield. TU 147. E. Oblique proximal view of C. pelagicus with part of the inner shield broken away. TU 147. Navicula digito-radiata R. in P.
differed little from those of the mud-flat and saltmarsh environments there today. No evidence was found to indicate completely freshwater or fluviatile conditions. Solent - Bibliography - General. Anderson, F. W. 1933. The New Docks Excavations, Southampton. Papers and Proceedings of the Hampshire Field Club, vol. 12, pp. 169-176. Black, M . 1968. [By Professor Maurice Black] Taxonomic Problems in the Study of Coccoliths. Palaeontology, vol. 11, pp. 738-813. Buhler, C. F. 1952. Repairs to Calshot Castle in 1612. Papers and Proceedings of Hampshire Field Club, vol. 17, 247-251. Churchill , D.M. 1965. 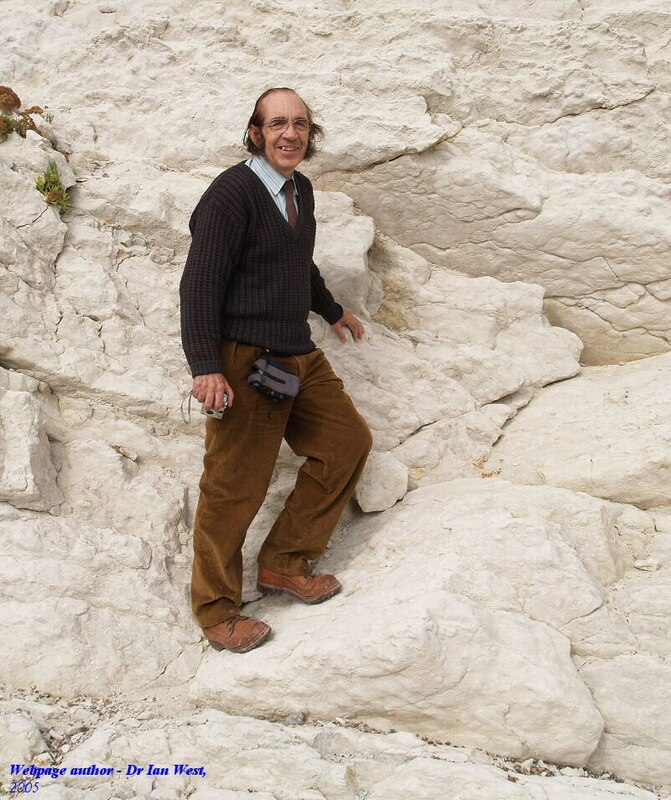 The displacement of deposits formed at sea level 6500 years ago in southern Britain. Quaternaria, vol. 7, 239-249. Introduction: Submerged forests on the present coast of Britain, probably attracted interest long before Pepys drew attention to the presence of hazel fruits in peat exposed in the dock excavation at Tilbury, some 300 years ago. One coastal peat bed that is known to have formed in situ, is recorded at 60 to 65 feet below O. D. (Godwin and Willis, 1964) from \Port Talbot in Southern Wales. The bottom of the peat there has been dated at 10,000 B. C. A deeper but undated bed is the peat revealed by recent borings on the seaward side of the Chesil Beach near Weymouth, where it was found 83 to 85 feet below O. D., and in Holland, Jelgersma (1961) recorded five centimetres of peat 75 feet below sea-level that was radiocarbon dated to circa 7,700 B. C. Overlying these and younger peat deposits that have developed in situ there are estuarine and marine clays,. silts and sands, as well as other peat beds that alternate with these, as at Fawley near Southampton and at Tilbury. The occurrence of such deposits has been recognised by Reid 1913, Wright 1937, and Godwin 1943, as the product of rising sea-level, downwarping or both of these processes at work since the time when the deposits were formed. The extent to which the relative shift of land- and sea-level is indicated by the presence of coastal peat deposits, requires the careful consideration of the relationship of the peat bed to its contemporary sea-level. Godwin (1943) has stressed the need for caution in relating a sequence of peat overlain by marine clay, to a changing in sea-level. Such peat beds may accumulate close to the mid-tide level behind barriers such as shingle spits and sand dunes, which can break down, expose the peats to the full tidal range and bury them under marine sediments without any change in level. Such a sequence as this however is characterized by sharp lithological boundaries and an absence of gradual succession by plants and animals. When a demonstrable sere that extends gradually, without interruption, from marine sands or clays with shallow water molluscs, foraminifera and diatoms, through saltmarsh clays with saltmarsh plants such as Suaeda maritima and molluscs such as Hydrobia or Scrobicularia, into brackish-water peaty clays with such plants as Cladium and Phragmites, and thence into eutrophic fen peats, fen carr or fen wood, there is some justification to suppose that the lowermost peat facies could have grown at a level somewhere in the tidal range, and thus be related to sea-level. For the present purpose of measuring subsequent changes in level, the lowermost datable peat from such a continuous succession of marine to freshwater deposits, provides the closest practicable index to sea-level. At the same time such facies may have formed at any level between that of mid- and high-tide. At only two sites (Burnham and lmmingham) have the peats used in this study not been shown to be part of a continuous halosere, and only because they are thin beds containing high frequencies of Chenopodiaceae pollen and found alternating with estuarine clays, is there any reason for including in them here. The extent to which the level of the deposits may be altered during their post-depositional history by loss of water or compaction of the underlying sediments by thick overburden, can result in peats in a maximal compression ranging between 80 to 90% of the original thickness (Jelgersma, 1961), and in sands as little as 2% (Athy, 1930). Clearly the horizons least susceptible to changes in level due to the progressive accumulation of overburden, are those organic horizons in contact with the underlying mineral substratum. Those most susceptible to changes of level are those organic horizons in contact with overlying mineral deposits as well as those. deposits that overlie deeper peat beds. Among the sites studied here, it is only at Tilbury and Alphen that the peats concerned are not those from the lowermost contact with the mineral substratum, and therefore liable to some downward compression. Curry, D., Hodson, F. and West, I.M. 1968. 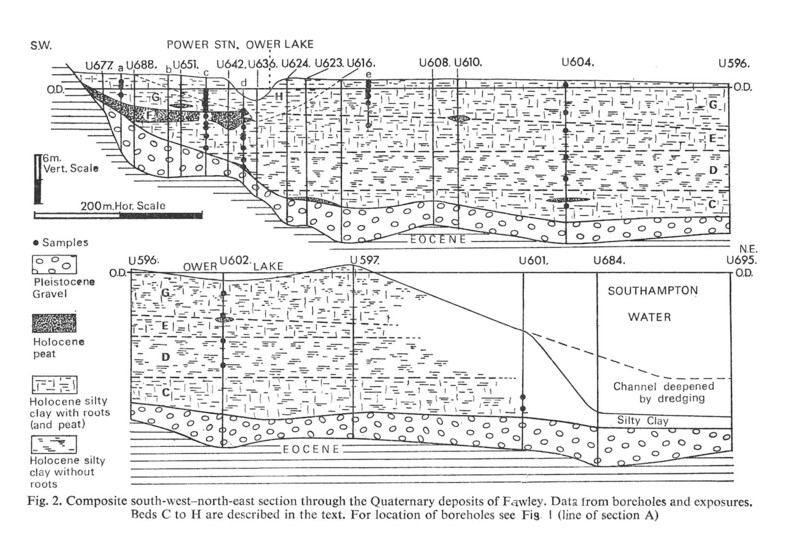 The Eocene Succession in the Fawley Transmission Tunnel, Proceedings of the Geologists' Association, vol. 79, pp. 179-206. Dyer, K.R. 1969. [Dr. Keith Dyer] 1969. Some Aspects of Coastal and Estuarine Sedimentation. Ph.D. Thesis, Southampton. Everard, C. E. 1954. Submerged Gravel and Peat in Southampton Water. Papers and Proceedings of the Hampshire Field Club, vol. 18, pp. 263-85. Evans, G. 1965. Intertidal Flat Sediments and their Environment of Deposition in the Wash. Quarterly Journal of the Geological Society, London. vol. 121, pp. 209-45. Gilkes, R. J. 1968. Clay Mineral Provinces in the Tertiary Sediments of the Hampshire Basin. Clay Mineralogy, vol. 7, pp. 351-61. Godwin, H. and Godwin, M.E. 1940. Submerged Peat at Southampton; Data for the Study of Postglacial History. New Phytologist, vol. 39, pp. 303-7. Godwin, H. and Switzur, V. R. 1966. Cambridge University Natural Radiocarbon Measurements VIII. Radiocarbon, 8, pp. 390-400. Hodson, F. and West, I.M.. 1970. Calcareous Nannoplankton from an Upper Bracklesham Horizon at Fawley, Hampshire. Revue de Micropaleontogie, vol. 13, pp. 165-87. Hooley, R.W. 1905. Excavations on the Site of the Electric Light Works, Southampton, May 1903. Papers and Proceedings of the Hampshire . Field Club, vol. 5, pp. 47-52. Jelgersma, S. 1967. Sea-level Changes during the last 10,000 years. In J. S. Sawyer (Editor): Proceedings of the International Symposium on World Climate 8000-0. B.C. London. 229 pp. Kemp, J. T. 1890. The Tufaceous Deposits of the Test and Itchen. Papers and Proceedings of the Hampshire Field Club, 1, 83-9. McIntyre, A. and Be, A. W. H. 1967. Modern Colithophoridae of the Atlantic Ocean. I. Placoliths and Cyrtoliths. Deep Sea Research, vol. 14, pp. 561-97. Oakley, K. P. 1943. A Note on the Post-Glacial Submergence of the Solent Margin. Proceedings of the Prehistoric Society, N.S., vol.9, pp. 56-9. Raymont, J. E. G. and Carrie, B. G. A. 1964. The Production of Zooplankton in Southampton Water. Int. Revue geo, Hydrobiol., vol. 49, pp. 185-232. Scholl, D. W., Craighead, F.C. and Stuiver, M. 1969. Florida Submergence Curve Revised - its Relation to Coastal Sedimentation Rates. Science, N. Y., vol. 163, pp. 562-564. Shepard, F. P. 1960. Gulf Coast Barriers. In F. P. Shephard, Phleger, F.B. and Van Andel, T.H. (Editors): Recent Sediments, Northwest Gulf of Mexico. Tulsa. 394 pp. Shore, T. W. 1893. Hampshire Mud1ands and other Alluvium. Papers and Proceedings of the Hampshire Field vol. 2, pp. 181-200. Shore, T.W. and Elwes, J.W. 1889. The New Dock Excavation at Southampton. Papers and Proceedings of the Hampshire Field Club, vol. 1, pp. 43-56. Valentin, H. 1953. Present Vertical Movements of the British Isles. Geographical Journal, vol. 119, pp. 299-305. Bray, M.J . and Hooke, J.M. 1997. Coastal cliff prediction with accelerating sea-level rise. Journal of Coastal Research, 13 (2), 453-467. Bray, M.J., Carter, D.J. and Hooke, J.M. 1992. Sea-Level Rise and Global Warming: Scenarios, Physical Impacts and Policies. Portsmouth Polytechnic. Report to SCOPAC. 205 pp. Bray, M.J., Hooke, J.M. and Carter, D.J. 1994. Tidal Information: Improving the Understanding of Relative Sea-Level Rise on the South Coast of England. University of Portsmouth, Report to SCOPAC, 86 pp. Bray, M.J., Hooke, J.M. and Carter, D.J. 1997. Planning for sea-level rise on the south coast of England: advising the decision-makers. Transactions of the Institute of British Geographers, N.S., 22, 13-30. Bray, M.J., Hooke, J.M., Carter, D.J. and Clifton, J. 2000. Littoral transport pathways, cells, and budgets within the Solent. Pp. 103-106 in: Collins, M. and Ansell, K. 2000. Solent Science - A Review. Elsevier, Amsterdam, 385pp. Caltex Services Ltd. 1957. Southampton Refinery; Proposed Marine Facilities. Report on Site Investigation, June 1957. Report by Rendel, Palmer and Tritton. Eleven pages of text, with logs of 25 shallow boreholes. Appendices contain the data of geotechnical tests (Liquid limit, plastic limit, sulphate content, lateral pressure, compression strength, density, moisture content, cohesion, pore-water pressure etc.). The study was part of a preliminary examination to arrange and supervise a borehole investigation programme for a marine oil terminal on the east bank of Southampton Water. This was in the vicinity of an area which had previously been selected for possible development as a new oil refinery site. Location: The proposed refinery site is on the eastern side of Southampton Water to the south-west of Hook Village and the tentative location of the marine terminal lay to the west of the site and south of the mouth of the Hamble River [No oil refinery was ever constructed on this east bank of the estuary but this is one of the investigations made with that purpose in mind. There is also a very close-contoured aerial survey, a copy of which is held at Southampton University.]. The boreholes are in Tertiary Bracklesham strata, overlain by Pleistocene gravel at various levels, and in some cases with Holocene muds, peat and gravel above. In geological terms the results are not remarkable but provide local detail on gravel terraces and Bracklesham stratigraphy. Cundy , A.B. and Croudace, I.W. 1996. Sediment accretion and recent sea-level rise in the Solent, southern England: inferences from radiometric and geochemical studies. Estuarine, Coastal and Shelf Science, 43 (4), 449-467. A detailed radionuclide and geochemical study has been carried out on recent sediments from the Solent estuarine system, Southern England. The vertical distributions of a series of radionuclides (210Pb, 137Cs, 238Pu, 239, 240Pu, 241Am and 60Co) have been examined which provide a measure of the rate of sediment accumulation in Southern England estuaries. The reliable use of radionuclides as indicators of sediment accumulation depends in part on their chemical immobility (lack of redox migration).60Co, in particular, shows evidence for redox mobilization, hence it is essential to use a number of chemically different or inert radionuclides to eliminate possible bias in calculated sediment accumulation rates. While local (intra-estuary) effects influence rates of sediment accumulation, the main control of vertical saltmarsh growth over the Solent area is a rise in mean sea level. Dating of saltmarsh cores indicates a 4�5 mm year-1 rise in relative sea level over the last 100 years, in good agreement with tide gauge data. Comparison with data from the literature implies that a recent acceleration in sea-level rise has occurred, from 1�2 mm year-1to 4 � 5�5 mm year-1, possibly due to changes in tidal regime or an acceleration in crustal subsidence. Dyer, K.R. 1980. Sedimentation and sediment transport. Pp. 20-24 in : Burton, J.D. 1980. The Solent Estuarine System: an Assessment of Present Knowledge. N.E.R.C. Publications Series C, No. 22 November 1980, ed. J.D. Burton, 100 p. NERC. [Extract:] Introduction: The Solent, Southampton Water and their tributary inlets form the drowned remnants of a previously extensive river system (see Section 2) which was incised to at least - 45m below present sea level. During the ensuing Flandrian transgression, the Isle of Wight Purbeck ridge was breached, and this has been followed by fairly rapid erosion during the last few thousand years, of the soft, plateau-gravel covered Tertiary rocks which has released large quantities of clays, sands and gravel. Continuing erosion indicates that an equilibrium configuration has yet to be attained. The tidal conditions within the area are complicated (see Section 5) with a tidal range that can reach 5m at Southampton. Within the Solowing a smooth curve, the currents change direction before high or low water. There is generally only a short period of slack water during the tidal cycle and the currents are almost symmetrical. The small differences that do occur, however, appear to be significant in the sedimentation patterns. In contrast, slack water within Southampton Water and the other inlets coincides with high or low tide, and complicated effects due to a double peak on the flood tide and a double high water at spring tides are present. These factors produce a fast, short duration, ebb flow and a slower, longer flood flow, with a long period of slack water at high tide. The coastlines of the area are exposed to wave action which is generally from a SW or SE quarter due to the sheltering effect of the Isle of Wight. Maximum surface currents exceed 2m sec-l in the West Solent and l.5 m sec-l in the mouths of inlets such as Portsmouth Harbour. Thickness of Sediment: Over most of the Solent area, seismic profiling has shown the sediment to be less than 2m thick. However, bare rock is not very extensive, and occurs only on the steep slopes of the channel in the West Solent, particularly in the vicinity of the Tertiary limestone ledges. The presence of other outcrops is shown by rolled clay fragments in some samples. Thicker sediments occur where the old river valleys have been filled in (Dyer, 1975), especially beneath the Brambles Bank, between the Nab Tower and St Helens Roads and beneath Calshot Spit, where a depth of 25m can be found. Sedimentary Topography: Coastal features indicative of longshore sediment movement are common in the Solent area. Most of the estuaries and inlets have well developed spits (called 'duvers' on the Isle of Wight) which have been derived mostly from material from local cliff erosion (Fig 1), and some of the smaller inlets have been effectively sealed off. Tidal deltas occur at the entrances to Langstone and Chichester Harbours, while elsewhere it seems that the currents across the mouths of the inlets are too strong for deltas to be formed. However, bars are present across smaller inlets with low tidal prism volumes. There are three main banks within the Solent. The Solent Bank in the West Solent previously had a barchan shape, but is now of much lower relief (Hydraulics Research Station, 1977)...[continues]. Haigh, I., Nicholls, R. and Wells, N. 2009. Mean sea level trends around the English Channel over the 20th century and their wider context. Continental Shelf Research, vol. 29, (17), pp. 2083-2098. By Dr. Ivan Haigh, Professor Robert Nicholls and Professor Neil Wells. This paper provides estimates of rates of change in mean sea level around the English Channel, based on an extensive new hourly sea level data set for the south coast of the UK, derived from data archaeology. Mean sea level trends are found to vary by between 0.8 and 2.3 mm/yr around the Channel. The rates of mean sea level change are calculated by removing the coherent part of the sea level variability from the time series of annual mean sea level before fitting linear trends. The improvement in accuracy gained by using this approach is assessed by comparing trends with those calculated using the more traditional method, in which linear trends are fitted directly to the original records. Removal of the coherent part of the sea level variability allows more precise trends to be calculated from records spanning 30 years. With the traditional approach 50 years is required to obtain the same level of accuracy. Rates of vertical land movement are approximated by subtracting the mean sea level trends from the most recent regional estimate of change in sea level due to oceanographic processes only. These estimated rates are compared to measurements from geological data and advanced geodetic techniques. There is good agreement around most of the UK. However, the rates estimated from the sea level records imply that the geological data suggest too much submergence along the western and central parts of the UK south coast. Lastly, the paper evaluates whether the high rates of mean sea level rise of the last decade are unusual compared to trends observed at other periods in the historical record and finds that they are not. Haigh, I, Nicholls, R. and Wells, N. 2011. Rising sea levels in the English Channel 1900 - 2100. Maritime Engineering, Proceedings of the Institution of Civil Engineers, Vol. 164, Issue MA2, pp. 81-92. Paper 2010-34. June 2011. By Dr. Ivan Haigh, Professor Robert Nicholls and Dr. Neil Wells. Ivan Haigh is at the University of Western Australia; Robert Nichols and Neil Wells are at Southampton University, England. Rising sea levels in the English Channel. There is great concern about rising sea levels in the coming century, particularly in terms of extreme sea levels and the increased likelihood of coastal flooding. This is especially true for the south-east coast of England where rising sea levels interact with a growing population and economy. This paper examines how extreme sea levels (excludingwaves) have changed through the twentieth century at 16 sites around the English Channel. Extreme sea levels were found to have increased at all 16 sites, but at rates not statistically different from the observed rise in mean sea level. Potential future changes in extreme high sea levels throughout the twenty-first century are estimated for nine UK south coast sites using the 2009 projections from the UK Climate Impacts Programme. For the low, medium and high emissions scenarios (12, 40 and 81 cm total ocean rise, respectively), the exceedence frequency of extreme high sea levels along the south coast would on average increase over the twenty-first century by a factor of 10, 100 and about 1800, respectively. Finally these changes are considered in relation to a large recent surge event in March 2008, which caused significant flooding in the central Channel. Hudson , M. 2001. Patterns in Time and Space on Solent Saltmarshes: a Combined Palaeoecological and Experimental Approach. 252 pp. 30cm. Unpublished Ph.D. Thesis, Centre for Environmental Science, University of Southampton, 2001. By Dr. Malcolm Hudson. One reference copy in the Hartley Library, Southampton University, Highfield, stack SU, Theses 2001.
. Velegrakis, A. 2000. Geology, geomorphology and sediments of the Solent System. Pp. 21-43 in: Collins, M. and Ansell, K. 2000. Solent Science - A Review. Elsevier, Amsterdam, 385pp. The Solent (Figure 1) forms the largest estuarine system of the southern coast of the UK. The constituent components of the system include the West and East Solent and their approaches, Southampton Water, Portsmouth, Langstone and Chichester Harbours and other smaller tributary river estuaries (e.g. Beaulieu, Lymington and Yar) found along the southern Hampshire and Isle of Wight coastlines. Parts of the coastline are characterised by coastal accumulation forms, such as barrier spits and islands (e.g. Hurst and Calshot Spits in the West Solent and Hayling Island in the East Solent), inter-tidal flats and saltmarshes (e.g. Lymington Flats). Erosional coastal environments (Le. coastal cliffs) are also present, particularly along the coastline of the Isle of Wight The offshore areas also show complex morphology (Figure 1), associated with several offshore banks and deeply-incised channels (e.g. Hurst Narrows). The Solent has attracted a great deal of human economic development, including extensive urban and industrial development, agriculture, shipping, fisheries, recreation, marine aggregate extraction and offshore oil exploration (Shell, 1987). At the same time, the area is associated with important conservation areas such as the National Nature Reserves (NNR), Sites of Scientific Interest (SSSI), Local Nature Reserves (LNR), as well as important archaeological sites. This diverse human activity both influences and is influenced by the physical characteristics and dynamics of the natural environment Therefore, frequent monitoring is necessary, in order to assess the human impact on the environment and its evolution and, equaIly important, to understand and predict the influence of such evolution on the regional economic development The understanding of the dynamic interrelationships between nature and economic development forms the 'backbone' of 'sustainable development' policies, which emerge as the main UK and European Union environmental strategy. Long , A.J. and Tooley, M.J. 1995. Holocene sea-level and crustal movements in Hampshire and Southeast England, United Kingdom. In: Holocene Cycles: Climate, SeaLevels and Sedimentation. Frinkl Jr. (Ed.). Journal of Coastal Research, Special Issue, 17, 299-210. This paper presents the results of an investigation into the Holocene depositional history of Southampton Water, southern England. A three phase history of estuary development is proposed. Between c. 7500 and 5000 BP (8200 to 5700 cal. a BP), mean sea-level rose rapidly from c. �9m to �4 m OD. During this interval thin basal peats which developed in present outer estuary locations were inundated and the area of intertidal and subtidal environments within the estuary expanded. Relative sea-level (RSL) rise began to slow between 5000 and 3000 BP (5700 and 3200 cal. a BP) and a phase of saltmarsh and freshwater peat accumulation occurred. In this interval freshwater peat-forming communities extended outwards and seawards across former saltmarsh and mudflat environments and caused a reduction in the extent of the intertidal area within the estuary. During the late Holocene there was a switch to renewed minerogenic sedimentation as most of the freshwater coastal wetlands of Southampton Water were inundated. This tripartite model is broadly applicable to the Thames and the Severn estuaries, suggesting that regional processes have controlled their macroscale evolution. RSL change and variations in sediment supply emerge as key controls during the first two phases of estuary development. The late Holocene demise of the estuary wetlands probably reflects a propensity for increased sediment reworking and unfavourable conditions for the accumulation and preservation of organogenic deposits due to reduced rates of long-term RSL and watertable rise. West, I.M. 1980. 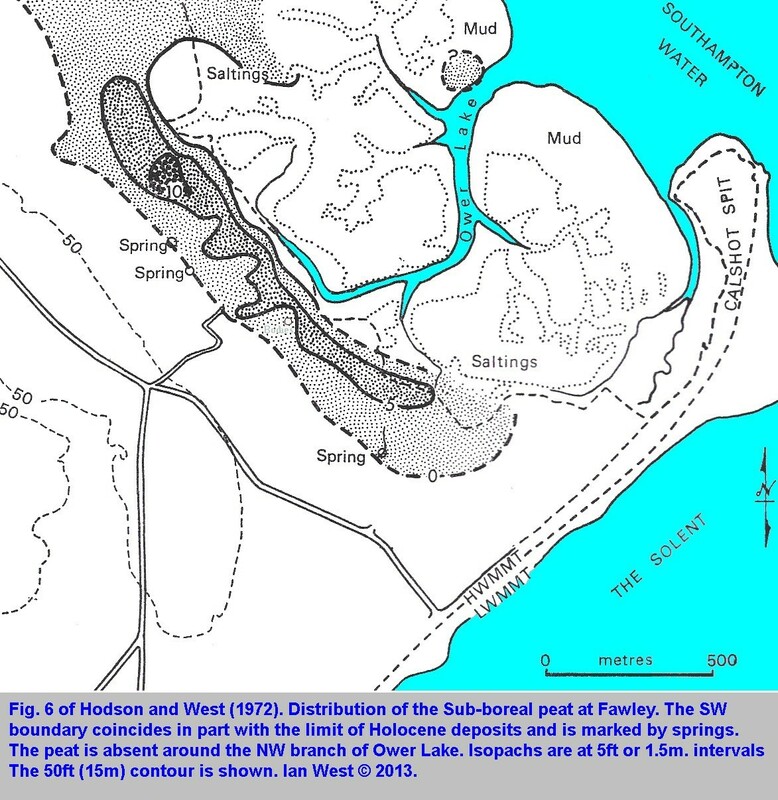 Geology of the Solent Estuarine System. In: The Solent Estuarine System: an Assessment of Present Knowledge, N.E.R.C. Publication Series C., No. 22 , November 1980. pp 6-18. Ed. J.D. Burton. [A concise review of knowledge of the geology of the estuaries up to 1980 with reference list, including discussion of the Eocene strata, the Pleistocene gravels and interglacial deposits, and the Flandrian Transgression of the submerged and partly buried valley system. Westaway, R., Bridgland, D., White, M. 2006. The Quaternary uplift history of central southern England: evidence from the terraces of the Solent River system and nearby raised beaches. Quaternary Science Reviews, vol. 25, September 2006, pp. 2212-2250. Available Online. By Rob Westaway (Open University), David Bridgland (Durham University) and Mark White (Durham University). We have used fluvial (Solent River system) and marine terraces to reconstruct the uplift history of central southern England. In the case of the former, we make the assumption that fluvial incision has been a direct response to surface uplift, with its precise timing controlled by climatic forcing of fluvial activity, such that height of terrace gravel above modern river is a consequence of uplift since deposition. In the case of the marine sequence, we take the height of interglacial raised beaches above a calculated contemporaneous sea-level as a measure of uplift, the calculation involving an adjustment from modern sea-level using the deep oceanic oxygen isotope signal as an indication of global ice volume at the time of deposition. This exercise requires some degree of dating constraint, which is problematic for both environments. The Solent terraces have yielded little biostratigraphical evidence, whereas the south coast raised beaches have either been poorly exposed in recent years or their ages have been controversial because of disputes between biostratigraphy and geochronological data. We have supplemented the evidence available from these sources by using key aspects of the archaeological record as dating constraints, in particular the first appearances of Levallois technique (a marker for MIS 9-8) and of bout coup� handaxes (MIS 3). The first of these has been particularly useful in modelling of the Middle Pleistocene parts of the river terrace staircases of the Solent system. In undertaking this reappraisal, we have noted several inconsistencies and disagreements between past correlation schemes for the terraces of the Solent and its various tributaries. We find that versions involving shallower downstream gradients in the main Solent River are most likely to be correct and that revisions on this basis solve a number of problems in interpretation encountered previously. Our results show that most of this region has uplifted by ?70 m since the late Early Pleistocene and by ?150 m since the Middle Pliocene, there being a high degree of consistency between uplift histories inferred for river terraces and marine terraces. Uplift rates increase gradually westward, such that along the River Frome at the western end of the Hampshire Basin ?80 m of uplift since the late Early Pleistocene is indicated. This variation is interpreted as a consequence of a regional-scale variation in crustal properties. About 80 m of uplift is also indicated on this timescale by raised beaches in the Portsdown area and adjacent terraces of the River Test and Solent in the vicinity of the Portsdown anticline to the north of Southampton. We interpret this as a consequence of ?10 m of vertical slip in the past million years on the blind reverse fault beneath this anticline. This dataset thus provides the first clear indication of measurable Quaternary structural development in crustal basement in the onshore UK. The Solent has formed more than a single terrace per 100 ka Milankovitch cycle, leading us to attribute terraces to isotopic substages, potentially improving upon the resolution available from sequences in which terraces formed once per cycle. Athough the first appearence of Levallois technique was initially considered to date from the MIS 9-8 transition, based on evidence from the Thames, we found that there was a better modelling fit if this was taken as having occurred slightly earlier, in MIS 9b, perhaps in association with the post-MIS 9e or 9c marine regression, which could have permitted immigration into a previously insular Britain of people versed in Levallois technology. Copyright © 2013. Ian West, Catherine West, Tonya West and Joanna Bentley. All rights reserved. This is a purely academic website and images and text may not be copied for publication in books, for use on other webpages or for any commercial activity. A reasonable number of images and some text may be used for non-commercial academic purposes, including field trip handouts, lectures etc, providing source is acknowledged. Diagrams or photographs from this website cannot be published in books for sale without specific permission; publishers or authors should give the file name of any image requested for a copyright clearance check.